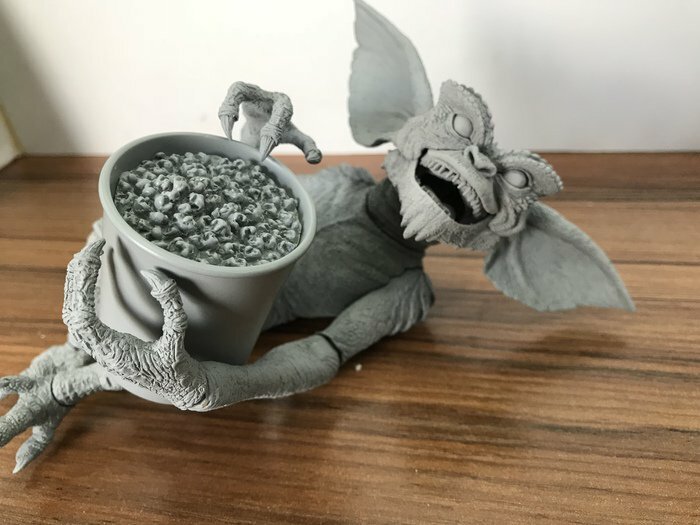 Back at Toy Fair 2018, we got our first early look at the Ultimate Gremlin 7″ Scale Figure from NECA. The figure, which is still in development, will be a perfect companion piece to the Ultimate Gizmo Figure. At the show, they previewed some of the accessories, such as candy bars, a beer mug, a soft drink cup and more. 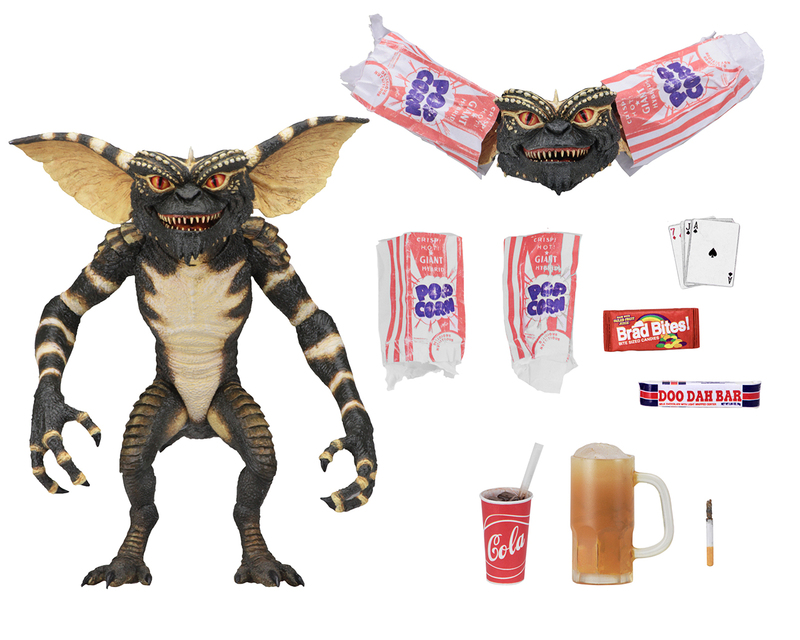 Today, NECA shared a new preview of the Ultimate Gremlin figure. The preview showcases a new look at the figure, as well as a new accessory, which is a bucket of popcorn. Now he just needs some 3D glasses! We’ll have more photos and details as they become available. For now, click the thumbnail to check it out. If only they'd make Greta, but nope. Beer mug. After Toy Fair on Twitter Randy pretty much confirmed that Stripe is happening. He did not clarify if it would be a separate figure or an alternate head for this one but to me it sounded like Stripe would be a separate release with unique accessories like the chainsaw and pistol. I love gremlins. I cannot wait for these!!!! Joe made it a separate article. It seems to me that the implication is that Stripe will be a separate release but it's possible that he could just be alternate pieces (though that would make this a rather sizable package). On Twitter it was announced as a separate figure. Oh my! it looks so cool! I want il so much! I guess the difference is people are more likely to purchase multiple of these as where you would only have one Greta per collection, additionally they're already also reusing this body for Stripe. NECA's Gremlins have always been out of scale with their other figures unfortunately. 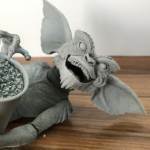 Since gremlins are barely over two feet tall I think the Funko reaction offerings might not be too bad if you want gremlins that scale with 6 or 7 inch figures. I don't own any of the reaction ones but I seem to remember they weren't a bad size. 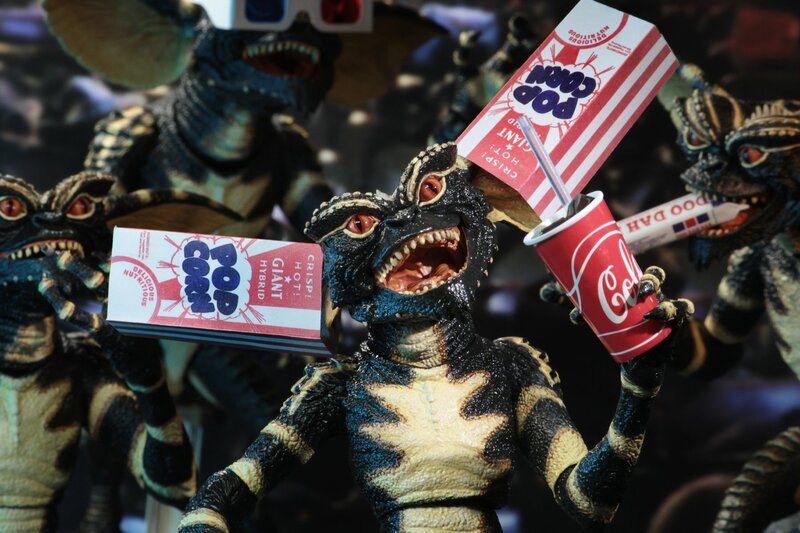 It would be cool if NECA did a creature pack of assorted gremlins that scaled with their standard releases. I hope the popcorn bucket and 3D glasses come with Stripe. has anybody purchased any from the pre-order yet if so how many?